Handel was not a professional organist. He did not hold a church position, nor did he leave much published organ music. But he did have the reputation of being one of the finest keyboard players of his generation, in Germany, in Italy and in England. His style of playing was said to be peculiar, and he played with vigour and invention almost till the end of his life. Some of his final organ concerti were composed when he had gone blind, and the hurry to finish the scores for performance meant that he relied on his own powers of improvisation, leaving the orchestra with little more than a skeleton or ritornelli. The organ played an important part in his music. Handel directed performances of his church music and oratorios from the organ keyboard. His earliest church music in England was written for James Brydges, later Duke of Chandos, at Cannons Park in Middlesex, now on the northern edge of London. In 1994 Martin Goetze and Dominic Gwynn made a new organ based on surviving parst dating from 1716 for the church of St Lawrence Whitchurch. This was the parish church near the Duke’s palace at Cannons, and was used for the elaborate church services for which Handel wrote the ten Chandos anthems, a Te Deum and a Jubilate, and the early oratorio Esther. Handel worked for the Duke during 1717 and 1718, a very pleasant and productive period for him. The present organ is a reconstruction of the organ Handel would have known, based on the surviving parts in this organ and in others by the same builder, Gerard Smith. The chapel in the house at Cannons Park was not completed till 1720, when it received a three manual organ by Abraham Jordan. Parts of this organ from the chapel still survive at Holy Trinity, Gosport in Hampshire, including some of the elaborate case and parts of eleven stops. No doubt Handel’s music continued to be performed at Cannons, but Handel was no longer the Duke’s director of music. The house has disappeared, but the interior decoration of the chapel survives at the chapel at Great Witley in Worcestershire. Between 1735 and 1741 Handel’s career turned from Italian opera to English oratorio. There was not much opportunity in sacred music for the kind of virtuosity which had so delighted the audiences at his operas, so he introduced into the intervals after the main choruses organ concerti which were designed to be a display of his ability and invention on the keyboard. The results were published as the organ concerti Op 4 and Op 7. These are amongst the most recorded and performed pieces of music in the world. A good idea of how Handel might have heard them himself has now been supplied by Paul Nicholson at the organ at St Lawrence Whithcurch, with the Brandenburg Consort under the direction of Roy Goodman (Hyperion records; CDA67291/2). This organ still survives, not quite as Handel recommended, but in almost original condition, at the church of Great Packington in Warwickshire, the House of the Earl of Jersey. It has the same stoplist as the letter, with the addition of a second keyboard, with three stops on a Choir (or ‘soft’) organ, with Stop Diapason 8′, Flute 4′ and Fifteenth 2′. However, the Great Tierce on the Great and the Choir Fifteenth are alterations of 1790; the original stops were reed stops, despite Handel’s recommendations. Also, an inscription records that the organ was made by Thomas Parker, not Richard Bridge. But Parker is supposed to have been Bridge’s apprentice, which looks obvious when this organ is compared with an organ which is known to be by Bridge: St Leonard Shoreditch in London, built at the end of Bridge’s career in 1756. The new organ has lived in Handel’s parish church of St George’s Hanover Square since it was built. It plays an active part in the annual Handel Festival. A later model of chamber organ, also from the same workshop, but with a mahogany case instead of the oak case used in the organ at Kew Palace, survives in examples in the chapel of Merton College Oxford, at Beeleigh Abbey in Essex (a private house) and at the Russell Collection of keyboard instruments in Edinburgh. These were probably made at the end of Handel’s life, but the organs at Beeleigh Abbey and the Russell Collection are interesting because they are associated with the Foundling Hospital (the main London orphanage) where Handel was a governor, and where he directed many performances of Messiah. In 1750 Handel bought a large organ for the Foundling Hospital chapel, but this organ cannot have been well made, for it was replaced in 1768 by another large organ by Thomas Parker. This organ had a tuning system devised by Robert Smith, a professor of astronomy at Cambridge and President of Trinity College, which required four extra pipes in the octave, for db, d#, ab and a#, notes missing in the mean-tone tuning system. Levers allowed the player to choose either the flat keys, or the sharp keys. 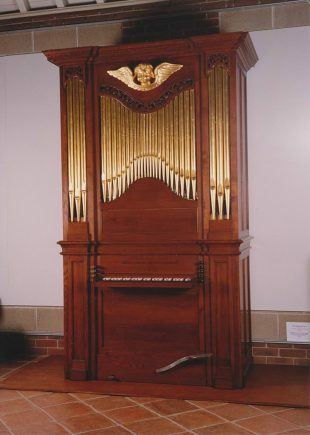 The chamber organ belonging to the Russell Collection also originally had this tuning system. 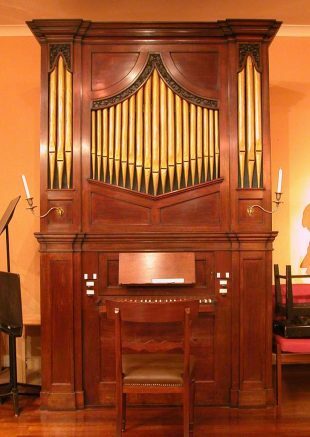 The missing enharmonic pipes and the mechanism have been restored by Martin Goetze and Dominic Gwynn in 1997. 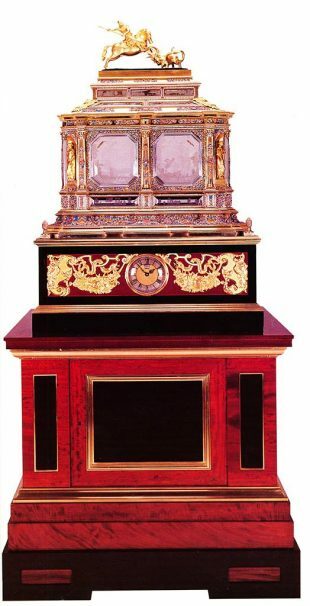 A more frivolous example of Handel’s craft is to be found in a clockwork barrel organ which belongs to the Queen and can be seen in the State Rooms at Windsor Castle. This organ was assembled in 1740 by Charles Clay, a clockmaker who specialized in elaborate machines. He called this organ-clock “The Temple and Oracle of Apollo”. The music on the barrel was supplied by Handel. They are mostly arrangements of opera arias (from Xerxes, Arianna and Ottone), and from keyboard pieces, much simplified, and set a minor third high in pitch. The organ has three stops (Open Diapason, Stop Diapason and Flute) and twenty pipes from c¹ to c³. In 1996 the organ was restored by Martin Goetze and Dominic Gwynn, and the clock and the magnificent case were restored by craftsmen from the Royal Collection.